To Cite: Nashibi M, Mottaghi K, Faraji M, Delavari A, Taghipour H, et al. 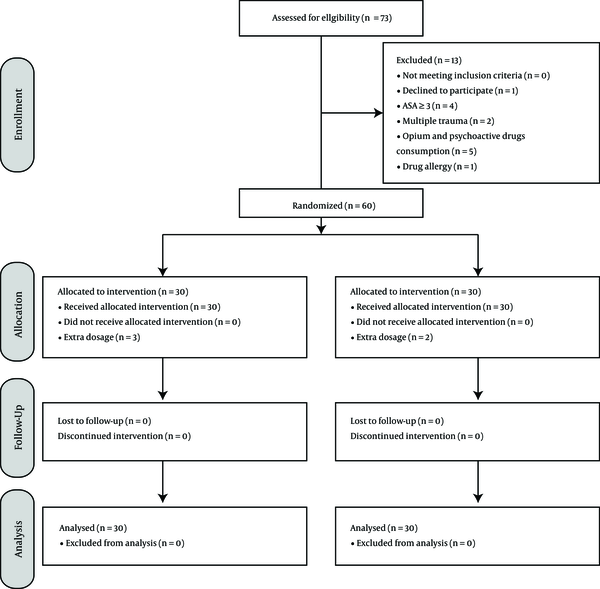 Comparison of Analgesic and Sedative Effects of Ketamine-Propofol (Ketofol) and Fentanyl-Midazolam (Fentazolam) Combinations in Outpatient Orthopedic Procedures, Trauma Mon. 2017 ; 22(5):e41315. doi: 10.5812/traumamon.41315. Background: Pain control is essential for ideal care of surgery patients. Noninvasive or minimally invasive procedures outside the operation room have had an increasing trend in the recent years. Sedation, analgesia or both may be necessary for the majority of these diagnostic or interventional procedures. Objectives: We sought to compare sedative and analgesic effects of Ketamine-Propofol (Ketofol) and Fentanyl-Midazolam (Fentazolam) Combinations in emergent outpatient orthopedic operations. Methods: Sixty male candidates for closed reduction of Colle’s fracture were divided into two groups of ketamine-propofol (Ketofol, KF) and fentanyl-midazolam (Fentazolam, FZ). Pain, sedation score, hemodynamic variables, recovery times, patients’ and the operator’s satisfaction and complications were evaluated. Results: Pain score decreased 4.57 units in the KF group and 3 units in the FZ group (P < 0.001); this decrease was more significant in the KF group in comparison with the FZ group (P < 0.001). The patients’ sedation score during the procedure was 3.43 ± 0.73 and 2.4 ± 0.49 in KF and FZ groups, respectively (P < 0.001). The 5th minute systolic blood pressure was significantly higher in the KF group in comparison with the FZ group (P < 0.001). The 5th minute diastolic blood pressure was significantly more in the KF group in comparison with the FZ group (P < 0.001). The 5th minute pulse rate was significantly greater in the KF group in comparison with the FZ group (P < 0.001). The mean recovery time was significantly more in the FZ group (25.6 versus 18.67 minutes, P < 0.001). The mean patient’s satisfaction was 4.37 ± 0.85 in the KF group and 3.73 ± 0.87 in the FZ group (P = 0.006), and the mean doctor’s satisfaction was 4.35 ± 0.89 in the KF group and 3.27 ± 1.08 in the FZ group (P < 0.001). Conclusions: Ketamine-Propofol, with lower dose of each drug, had a better sedation and analgesic effect as well as lower complications and shorter recovery time when compared to fentanyl-midazolam. Pain is an unpleasant sensational experience associated with tissue damage (1). During the operations, pain receptors could be stimulated by skin incision or tissue damage and lead to pain by imposed soft tissue tension and nerve damage (2). Physiologic response to damage or pain-associated stresses include respiratory, cardiac, gastrointestinal and urinary disorders as well as behavioral, metabolic and endocrine changes. Pain control is essential for ideal care of surgery patients (3, 4). Despite recent progression in pain pathophysiology, pharmacology and development of techniques in treatment of perioperative pain, some patients still experience pain (5). Modern implications of postoperative pain treatment are focused on pain specific receptors control through multimodal pharmacologic intervention, before painful stimuli (6). Effective analgesia and pain control can decrease morbidity and mortality (7). Noninvasive or minimally invasive procedures outside the operation room have had an increasing trend in the recent years. Sedation, analgesia or both may be necessary for the majority of these diagnostic or interventional procedures (8-10). Nowadays, a combination of benzodiazepines and opioids are commonly used for sedation and analgesia. This combination is associated with prolonged time of drugs’ effect and delayed discharge after intervention; moreover, they may cause nausea, vomiting, apnea and muscle rigidity. One of the combinations of this family is fentanyl-midazolam (FZ) (10). New combinations like ketamine-propofol (KF) may replace previous regimens. Ketamine could potentially cause hallucination, nystagmus and myoclonus, when used as a single agent, but in combination with hypnotics, these side effects could be avoided (11). We aimed to compare sedative and analgesic effects of KF and FZ in emergent outpatient orthopedic surgeries in order to find the appropriate drug combination for analgesia and sedation in emergency cases with less complications and greater satisfaction rate. In this randomized double blinded clinical trial, 20 to 40 year-old males with Colle’s fracture, candidates for outpatient closed reduction, referred to Emergency Department from February to September 2014. The study protocol conformed to the ethical guidelines of the 1975 Declaration of Helsinki, as reflected by a prior approval from the institution’s human research committee. Patients with American society of anesthesia (ASA) physical status III or more, history of allergy to ketamine, propofol, midazolam, fentanyl and egg, increased intracranial pressure, multiple trauma, impaired mental status, cognitive disorders, and patients who were opium abusers or had a history of psychoactive drugs use, were excluded from the study. The study flow chart is shown in Figure 1. Informed consent was obtained from each patient included in the study. Patients were randomly assigned to two groups using a balanced block randomization method with a block size of five patients. Weight was measured with subjects wearing light clothing and no shoes, using a standard scale. Sedation and analgesia was accomplished using ketamine (0.5 mg/kg/IV) plus propofol (0.5 mg/kg/IV) in the KF group and fentanyl (2 µg/kg/IV) plus midazolam (0.04 mg/kg/IV) in the FZ group, three minutes before the operation. If level of sedation and analgesia was not satisfactory, half of primary dose of the medication was injected. All patients were under electrocardiogram (ECG) monitoring, pulse oximetry and automated non-invasive blood pressure monitoring. Nasal oxygen (3 L/min) was administered to all patients during the procedure. Hemodynamic indexes (systolic, diastolic blood pressure and pulse rate), O2 saturation, and respiratory rate were measured before and five minutes after drugs administration. All procedures were done by the same specialist. Patients were informed about pain severity score (numerical rating scale (NRS)) (Figure 2) and satisfaction score (Table 1). The sedation level was scored according to Ramsay’s six-level scale (Table 2) during the perioperative period. Patients were observed for 30 minutes after the procedure and complications (apnea, agitation, myoclonus, cough, delirium, seizure, vomiting, bradycardia, rash, nystagmus and itching) were evaluated. The procedural sedation and analgesia (PSA) discharge criteria (Table 3) were calculated, and patients who obtained PSA score of 7 or above were discharged from the emergency department. Data were analyzed using the statistical package for social sciences (SPSS) version 18. The Kolmogorov-Smirnov test was used to assess the normality of the quantitative variables. Quantitative variables were compared using independent sample t-test and its equivalent nonparametric test (Mann-Whitney U test) between the two groups. Chi-square and Fisher exact tests were also used to compare qualitative variables between the two groups. This study was approved by our ethics committee (NO.134 on meeting 2/08/2014). The study protocol was explained to the participants and all of them signed a written informed consent. All parts of the study protocol were written based on the Helsinki Declaration. Both groups had effective analgesia and we did not have a placebo group. The patients’ personal information was kept secure. Sixty male patients with mean age of 31.98 ± 6.1 years were evaluated. The mean age was 31.83 ± 6.5 years in KF and 32.13 ± 5.9 years in FZ groups (P = 0.852). The pre-intervention Numerical Rating Scale was 7.2 ± 1.29 and 6.93 ± 1.2 in KF and FZ groups, respectively (P = 0.412). This score was significantly decreased after the intervention, by 4.57 units in the KF group and 3 units in the FZ group (P < 0.001). Regarding pain score reduction, decrement in the KF group was meaningfully more than the FZ group (P < 0.001). The patients’ sedation score during the procedure was 3.43 ± 0.73 and 2.4 ± 0.49 in KF and FZ groups, respectively (P < 0.001). There was no significant difference in systolic blood pressure between the groups before the operation (P = 0.158). The fifth-minute systolic blood pressure was significantly more in the KF group in comparison with the FZ group (P < 0.001). There was no significant difference in diastolic blood pressure between the groups before the operation (P = 0.196). The fifth minute diastolic blood pressure was significantly more in the KF group in comparison with the FZ group (P < 0.001). There was also no significant difference in pulse rate per minute between the groups before the operation (P = 0.102). The fifth-minute pulse rate was significantly more in the KF group in comparison with the FZ group (P < 0.001). There was no significant difference in SpO2 between the groups before and five minutes after the operation (P > 0.05). The mean recovery time was significantly more in the FZ group (25.6 versus 18.67 minutes, P < 0.001). Excess dosage was needed in three patients of the KF group and two patients of the FZ group (P = 0.335). Hemodynamic indexes and sedation are described in Table 4.
aValues are expressed as No. (%)or mean ± SD. The mean patients’ satisfaction was 4.37 ± 0.85 in the KF group and 3.73 ± 0.87 in the FZ group (P = 0.006), and the mean doctor’s satisfaction was 4.35 ± 0.89 in the KF group and 3.27 ± 1.08 in the FZ group (P < 0.001). Patients’ and doctor’s satisfaction are described in Table 5. One patient in each group had apnea, two patients of the KF group had myoclonus, 17 patients of the KF group had nystagmus, and 20 patients of the FZ group had brief itching. Emergence reaction occurred in two patients of the KF group, which was controlled with midazolam. The sedation-related complications are described in Table 6. We sought to compare sedative and analgesic effects of KF and FZ in outpatient orthopedic surgeries. We found that Ketofol, even at a lower dose, had better analgesic effects than Fentazolam. Propofol is widely used for sedation in different ambulatory procedures. When propofol is used as a single agent for short term procedures, unwanted experiences and adverse effects may develop (9, 12, 13). Combining propofol with other medications may result in decreased dose of both drugs and their side effects. Concerning the analgesic effects, KF provides better analgesia and sedation than propofol-fentanyl (14) and FZ (10), which is concordant with our findings. Combining propofol with a short-acting low-dose opioid is a good alternative for providing satisfactory sedation and analgesia without increasing side effects (13, 15); in the mentioned studies, KF fell behind propofol-opioids combination. In the study of Nejati et al., opioids combined with midazolam and KF sedation level was the same as FZ. We used 0.5 mg/kg of ketamine and propofol whilst Nejati used 0.7 mg/kg; this may explain why their KF group had deeper levels of sedation compared with our study. In our study, 0.5 mg/kg KF provided more cooperative patients than the FZ group. Gulec et al. (16) showed that KF provides better sedation than ketamine alone. Regarding hemodynamic stability, other studies showed that KF keeps the base heart rate and blood pressure of the patient and prevents bradycardia and hypotension (13, 17, 18), which is similar to our findings. This finding could be explained by compensation of propofol-induced hypotension and bradycardia with ketamine-induced hypertension and tachycardia, as Ayatollahi et al. (19) showed that a one to one combination of propofol and ketamine has the same hemodynamic effects as a 1 to 3 proportion. In contrast to our findings, some previous studies showed that combination of ketamine and midazolam had a long recovery time (18) and some others showed that KF recovery time was longer than propofol-remifentanil (13) and remifentanil alone (20). This could be explained by the combinations and dosage; Simsek et al. (18) combined ketamine with midazolam, which has a long recovery per se, and Oncul used 1 mg/kg propofol whilst we used 0.5 mg/kg. The short recovery time of the lower doses has been shown in other studies, which are in accordance with our study (19, 21). Patients’ and doctor’s satisfaction has been reported to be the same in different studies (10, 13, 20), which is not similar to our finding. This difference could be explained in accordance with sedation and analgesia. In our study, we used low doses of KF, which had better analgesic effects than the FZ group and made them more cooperative with the doctor led to more satisfaction of both the patient and the doctor. None of the patients experienced serious complications in our study, similar to other studies, which reported only minor complications in the perioperative period (19, 21, 22). The prevalence of complications in both groups was the same whilst the kinds of complications were not the same in each group. Propofol has antiemetic effects so it would be expected that less nausea and vomiting occur in the KF group compared with opioids as shown in some other studies (13, 20). Since ketamine has the least effects on respiratory drive, less respiratory side effects are expected, as shown in Yan et al.’s study (23). In our study we did not encounter any respiratory depression since we used a low dose of medications in young male adults. It would be more accurate to study larger populations at different ages and both genders. We concluded that ketamine-propofol, with lower dose of each drug, had a better sedation and analgesic effect as well as lower complications rather than Fentanyl-Midazolam. Although no significant complications were seen, patients should be under constant monitoring. Future studies with a larger volume of patients are suggested. The authors would like to thank all nurses and staff of the emergency department.